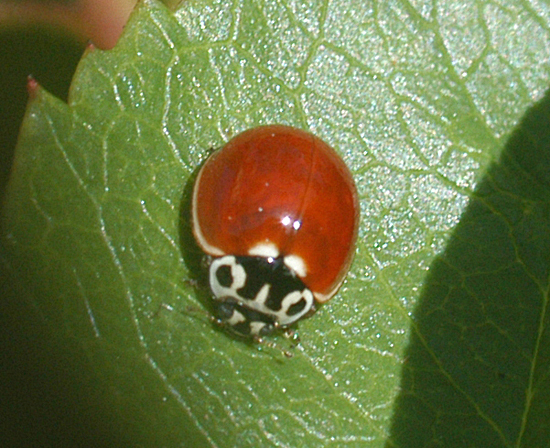 Coccinellidae, the family of beetles known as ladybirds in the UK, ladybugs in North America or lady beetles by entomologists consist of about 5,000 species worldwide and more than 450 native to North America. Ladybugs feed on aphids and scale insects and lay their eggs near their prey so the larvae can more easily find their prey. The insect's name has a long history, the Virgin Mary supplanting Freyja, the Norse fertility goddess, so that Freyjuhaena and Frouehenge have evolved to Marienvoglein or, Our Lady's Bird. In various parts of Europe they are known as Our Lady's Cow, God's Cow, (Russia) Mary's Hen, (Denmark) or God's Little Cow in Ireland and are generally thought lucky. They're certainly better at eliminating plant pests than the cat.